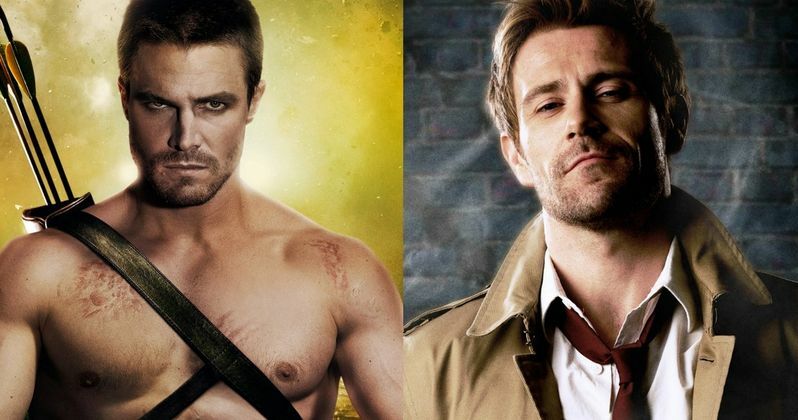 After weeks of speculation, The CW confirmed during their TCA summer press tour presentation that Constantine star Matt Ryan will guest star in a Season 4 episode of Arrow. The actor, whose Constantine series was canceled by NBC earlier this year, is slated to appear in the fifth Arrow Season 4 episode, entitled "Haunted". Entertainment Weekly reports that The CW's Mark Pedowitz teased during the presentation that, "a character is getting resurrected," which could be a big hint for why Matt Ryan's John Constantine will appear on the show. Last month, we reported that former Arrow star Caity Lotz will first appear in Season 4, before moving over to the midseason series DC's Legends of Tomorrow. Caity Lotz portrayed Black Canary on the superhero TV series before she was killed off in the Season 3 premiere. She will portray White Canary in DC's Legends of Tomorrow, and it is believed she will be resurrected through the Lazarus Pit during her appearance on Arrow. In the comics, John Constantine is an expert when it comes to the Lazarus Pit, and it seems this expertise will come in handy. Take a look at how The CW described his character, revealing he will lend a helping hand to Stephen Amell's Oliver Queen. "John Constantine is a weather worn exorcist and expert on the supernatural and the occult. He is a detective, magician, and a hunter of demons, and will provide critical support to Oliver (Stephen Amell) when arrows aren't enough." While it was never confirmed exactly what episode Caity Lotz will appear in, it seems possible that her resurrection and transformation into the White Canary will happen in this episode. We also recently reported that Hawkman (Falk Hentschel) will be introduced in Arrow before DC's Legends of Tomorrow, but we don't know if that will happen in this episode or not. Here's what executive producer Marc Guggenheim had to say about Matt Ryan joining Team Arrow. "We are thrilled to have Matt Ryan reprise the role of John Constantine on an upcoming episode of Arrow. Matt is an incredibly talented actor and his portrayal of this beloved character was always something we admired. The introduction of magic and mysticism on the show this season has provided a truly organic opportunity for us to bring John Constantine to Arrow and the CW's DC universe. It will be a well-deserved tip of the hat to all the Constantine fans who were so incredibly supportive of that series." If the first five episodes air on consecutive Wednesdays, after the Season 4 premiere on October 7, then this fifth episode, "Haunted", will air on November 4. Matt Ryan also released a brief video on his Twitter feed, where he announced the news to his fans. Check out the video, and let us know what you think about John Constantine coming to Arrow.